Mat Based Pilates - CoreBody Pilates + Yoga Inc.
A series of mat-based exercises focusing on stabilization of the body to tone and strengthen core abdominal muscles. Individual attention is provided in small group classes to achieve proper form and execution. 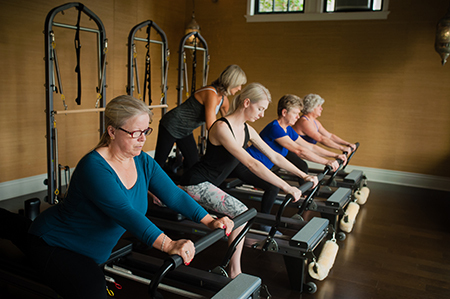 Being a boutique space, our groups consist of 5 – 8 clients whereby the focus is on alignment, and form with correction to help you achieve this! The focus is on teaching the principles, essential into intermediate mat based exercises needed to restore and improve core strength, pelvic floor, postural alignment, balance breathing and relaxation. We utilize flex bands, fitness rings, and small balls to make certain exercises either more challenging and or to help with alignment and execution. Though mat based training is considered by some the “introduction to pilates”, however, it can be very challenging and not to be misunderstood as where to start with pilates! Your body weight is used as resistance and should you have any injuries and or be in a rehabilitation situation, we would recommend machine-based training as a starting point. The machines in a one on one environment offers the support of the equipment and allows us to take gravity out of the equation! 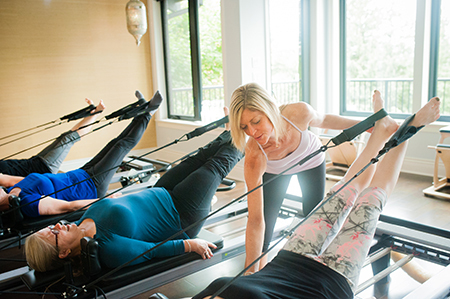 Currently in our Deep Cove space, we offer 2 mat-based pilates classes; Wednesdays 9:15am is a straight mat-based pilates class with Shelley running 1 hr 15 mins. Fridays Stephanie runs a combination pilates + yoga (hatha/yin) + thai massage class that runs Fridays 9:30am – 11:00am. Call Stephanie Roberts on the studio line 604-916-9335 or email nvcoregirl@gmail.com to inquire as to space. New to Pilates Mat Training? For those returning to pilates or new to pilates mat based work a private initial assessment is highly recommended to understand the foundational Principles of core connectivity, stabilization, breath work and basic repertoire. Focus is on controlled movements, proper alignment and how to transition from one exercise to the next. Small Pilates equipment is incorporated to work abdominals, inner thighs, hamstrings and buttocks and challenge balance and core stabilizers. 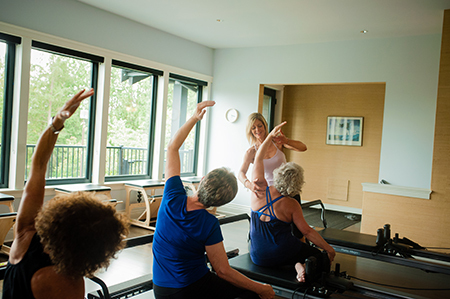 If you are interested in a private assessment to return to this work after a longer period off or are new to the pilates method please contact Stephanie Roberts at the studio 604-916-9335 or nvcoregirl@gmail.com. We offer an intro private package for those in need of more one on one attention.